Naked mole rats are able to survive for up to five hours without oxygen by effectively turning themselves into plants, it has been revealed. Scientists discovered that the rodents start metabolizing fructose when oxygen levels drop to levels that would kill a human within minutes. By doing so, they are able to generate energy anaerobically, placing themselves into a “suspended animation-like state.” This is something usually only associated with plants. Naked mole rats are cold blooded-mammals that live underground. They are virtually blind and have no hair. Yet they have some of nature’s most incredible traits. They can live up to 30 years—decades longer than other rodent species—and are insensitive to many types of pain. They also appear to be largely immune to cancer, with the first case of the disease in a naked mole rat only confirmed in 2016. Scientists have observed that the creatures can also survive for long periods of time with almost no oxygen. They live in burrows in huge colonies and, in these crowded conditions below ground, oxygen levels are quickly depleted. But how they managed to survive in this environment was a complete mystery. Until now. An international team of scientists led by Thomas Park, from the University of Illinois at Chicago, has discovered the biological mechanism employed by naked mole rats to live without oxygen. Their findings are published in the journal Science. In the study, researchers put naked mole rats and mice in low oxygen conditions. Findings showed that while the mice died in fewer than 15 minutes, the naked mole rats could survive for five hours. Furthermore, they were able to survive complete oxygen deprivation for up to 18 minutes. Throughout the experiments, scientists analyzed samples of their blood and tissues to monitor their metabolism. 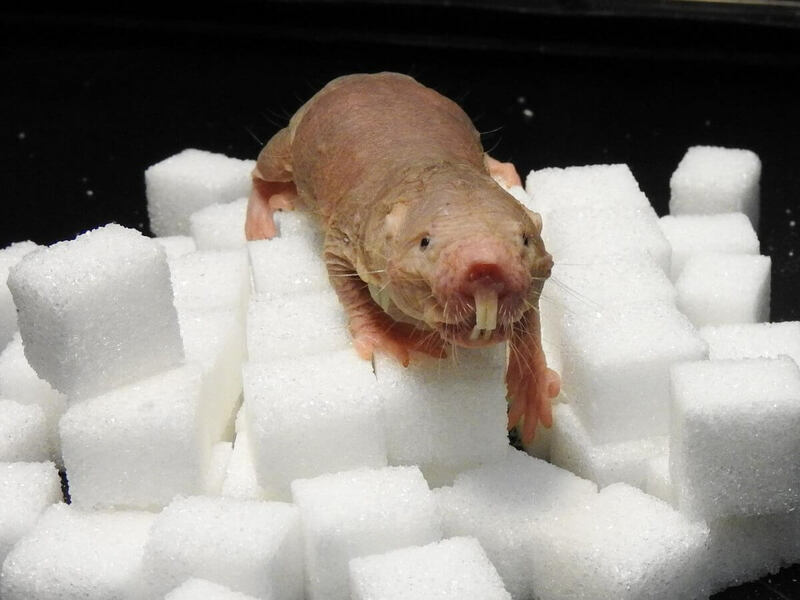 While deprived of oxygen, researchers noticed the naked mole rats released huge amounts of fructose into the bloodstream, switching their metabolism to a system that works the same way that plants get energy. While in low-oxygen conditions, researchers say the naked mole rats entered a state of “suspended animation,” with their heart rate dropping from around 200 beats per minute to just 50. As soon as oxygen levels returned to normal, the naked mole rats switched back to metabolizing glucose. By switching systems to maintain energy supply, the naked mole rats were able to protect their vital organs. “The naked mole rat has simply rearranged some basic building-blocks of metabolism to make it super-tolerant to low oxygen conditions,” Park said in a statement. Just as scientists are trying to work out what protects naked mole rats from cancer in the hope of creating new therapies for humans, so too will this research be used to develop treatments for people who suffer oxygen deprivation: “Molecular insights into the rewired metabolism of the naked mole rat may help in devising strategies to prevent hypoxic damage associated with ischemic heart disease and stroke,” the scientists write.